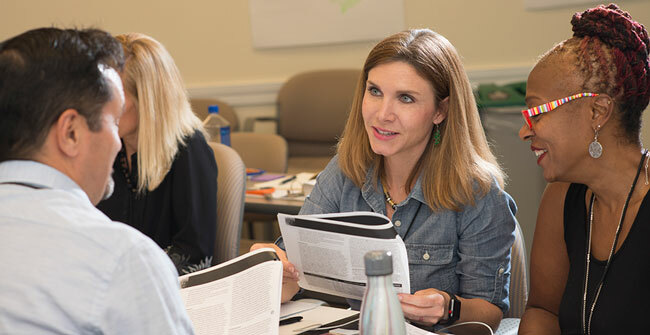 This program allows participants to attend three-day symposia held six times over the academic year while also engaging in instructional improvement projects on their home campuses. The symposia include a combination of structured instructional and faculty development activities as well as self-directed activities designed to meet individual needs. Participants receive a stipend for each day of full participation on campus to assist with travel expenses and meals. Lodging is provided by the Governor's Teaching Fellows Program. Participants in this program attend a two-week symposium on the University of Georgia campus. The symposium includes a combination of structured faculty development and instructional activities and independent study on the part of each participant. Use the directory to find past participants of the program from your discipline or institution. The Governor's Teaching Fellows Program is designed for faculty members who teach at accredited public or private colleges or universities, other than the University of Georgia, in the state of Georgia. Participants are selected on the basis of their teaching experience, their interest in continuing instructional and professional development, their ability to make a positive impact on their own campus, and a strong commitment by their home institution for release time and other forms of support for the duration of their participation in the program. Any full-time, regular faculty member can apply. With appropriate encouragement and support from one's institutional colleagues, candidates should send a letter of interest and intent to participate to the President of the home college or university describing how participation in this program will benefit both the individual and the home institution. A one to two page teaching philosophy statement. Applicants are encouraged to submit the application package electronically to gtf@uga.edu. Confirmation of receipt will be sent to the email address provided by the applicant. Program guidelines stipulate that no more than two fellows from the same institution may participate simultaneously. Therefore institutions are encouraged to limit the number of candidates submitted for consideration to no more than two per program — two for the Academic Year Program, and two for the Summer Program.